The Guardian’s Jason Farago has written a beautiful long-form piece about Ground Zero thirteen years after the terrorist attack of 9/11. The struggle to rebuild this part of town is emblematic of the New York of the 21st century. I have visited the site a few times and wrote about it on the blog once before. Architecturally speaking, it is a disappointment with the exception of Maki’s 4WTC. Farago recounts in great detail the tragedy that is Libeskind’s “Freedom Tower” and the endless shenanigans between the starchitect on the one side as well as developer Silverstein and architectural mega-firm SOM on the other. What New Yorkers are left with is a mediocre tower that would be best placed in Dubai. Just that in Dubai one could have built a total of four Burj Khalifas with the amount of money spent on 1WTC. But its remembrance-for-dummies style – the names of the dead plus waterfalls, at the giant scale Pataki demanded – hasn’t commended it to New Yorkers, and while it looks alright from the 57th floor balcony of 4WTC, at ground level it remains divorced from the fabric of the city. There are other interesting narratives, for example 9/11 breathing new life into Republican rule over a traditionally Democratic city. Bloomberg’s reign of the Big Apple has affirmed the primacy of capital. It has led to countless rezoning and redevelopment initiatives. It has led to an increasing polarisation of this city into those that have and those that have not. 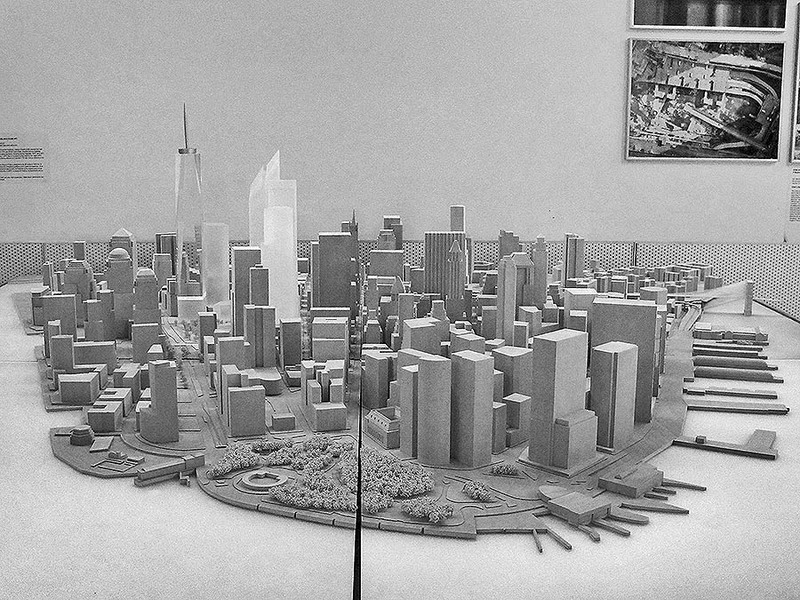 In the early 2000s, lower Manhattan was principally a site of trauma. In 2014 it evokes other, fresher troubles, among them massive income inequality, the impunity of the financial sector, a do-nothing Congress and a state government corrupted beyond redemption, and a record tourist influx that’s the flipside of the city’s gentrification and pacification. Another visual manifestation of the inequalities perhaps not so much at play at WTC, but nonetheless representative of today’s New York, is the emergence of super-slim residential architecture. I wrote about it on this blog here. Now go read Farago’s excellent piece.